Moleskine released several new planners for 2010 including the 2010 Panoramic Planner. Those of you who are looking for a planner with a unique layout and the inclusion of a monthly calendar on each weekly spread, this could be the planner you are looking for. It is pocket-sized and has a soft cover making it perfect for your back pocket or purse. This planner is thinner than hard cover versions and has a portable profile that feels substantially lighter than the hard cover planners. 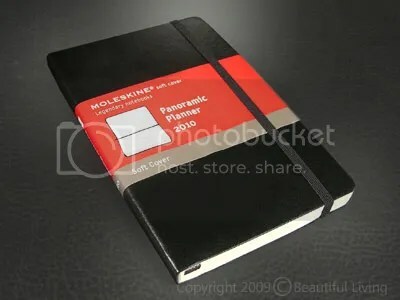 Moleskine's Panoramic Planner is a New Style for 2010. Open the planner and you’ll discover that the planning pages are rotated 90 degrees counter-clockwise from what you would expect. This puts the top of the calendar on the left page. At first this seems a little awkward until you write in it. The extra width is more comfortable than a narrower page, and you avoid having to write near the inner margins in the center of the journal! The Panoramic Format is Rotated 90 Degrees Counter-Clockwise from What You Would Expect. Each Week-to-View Includes a Small Monthly Calendar and a Contacts Section. 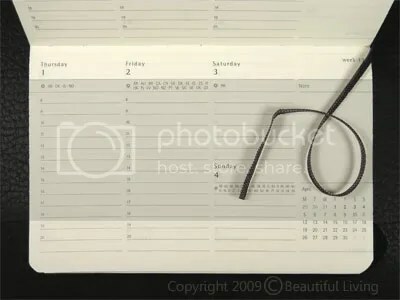 The panoramic orientation also includes some extras you won’t find in the standard Moleskine planners; a small column sectioned into To-Dos, Contacts and Notes. There is also a small monthly calendar of the current month highlighting the current week in bold. I get requests for this feature all of the time so I am glad that Moleskine finally added a monthly calendar to one of their planners. One Week of Planning Per 2-Page Spread. 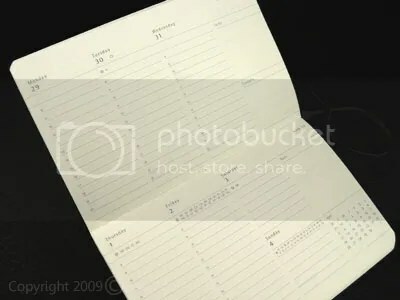 Each 2-page spread displays a week at a time and the planning slots are in a vertical format. The planning periods are broken down into 12, 1-hour slots in military time, 08:00 through 20:00. 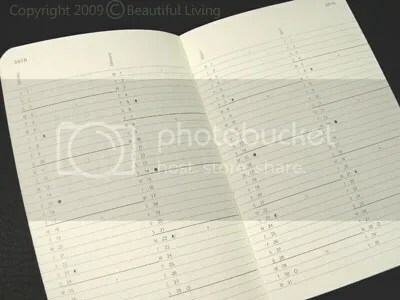 All of the standard Moleskine planner pages are here, too, including pages for Personal Data, Monthly Planning Calendars for long range planning for 2010 and 2011, International Holidays, a Time Zone Chart, International Dialing Codes, Distances, International Sizes and a Ruler. All of Moleskine's Standard Planner Pages are Here Including Long Term Planning Pages, Time Zones, International Dialing Codes, etc. Small but significat changes to Moleskine’s traditional planners add up to a nice little Panoramic planner with super planning capabilities. You should give it a tyr if you want a unique Moleskine Weekly Planner with a soft cover and small monthly calendar on each page. The Moleskine Panoramic Planner can be found at www.journalingarts.com.